1İ.Ü. 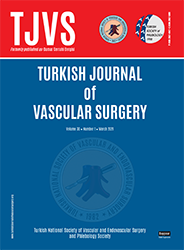 Cerrahpaşa Tıp Fakültesi, Göğüs Kalp ve Damar Cerrahi Anabilim Dalı, İsatanbul Venous ulceration is a well-known problem which effects almost 1-2 % of the population. The mainstay of the therapy is relieving of the venous hypertension with external compression and local wound care. In this study 20 patients with venous ulceration were assigned into two groups. in the first group, elastic com­ pression and wet draping were used and in the other group clostridiopeptidase A with elastic compression were used and the healing effect of clostridiopeptidase A on venous ulcers were evaluated. In the elastic compression and wet draping group, 8 of the 1O ulcers were healed during the study period of up to 6 months (mean 151.5). in 2 patients venous ulcers were persisted by the end of the study. in the elastic com­ pression and clostridiopeptidase A group, complete healing of all ulcers were observed during the study period (mean 103.5, p 0.05).